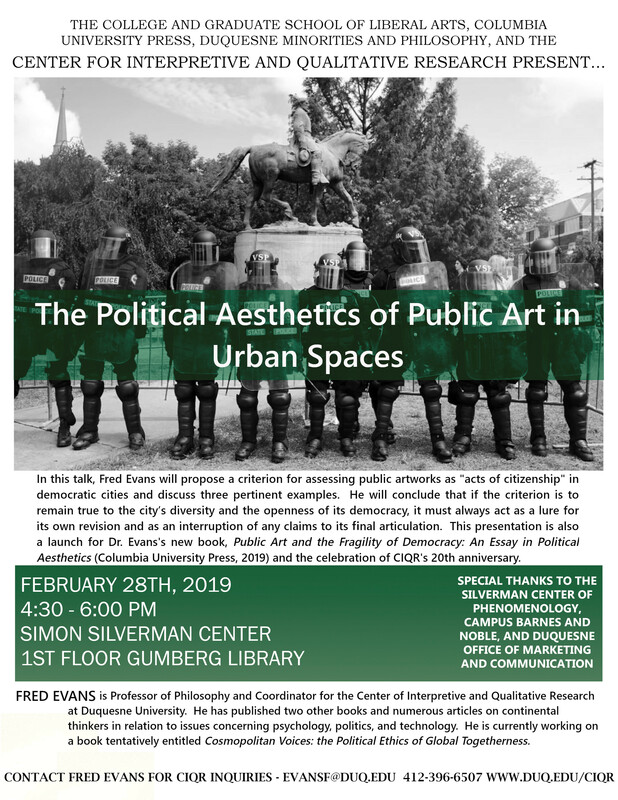 CIQR Presents: "The Political Aesthetics of Public Art in Urban Spaces"
Title: "The Political Aesthetics of Public Art in Urban Spaces"
Abstract: A leading art historian states that the controversies over monuments and other public art in the United States are "grounded in the dynamics of American citizenship and national memory: of who 'counts' as an American today and what America itself means and represents." These controversies and the violence that can attend them are brought vividly to mind when we think of the recent protests over the removal of Confederate monuments in the cities of New Orleans and Charlottesville. Because of its importance in shaping who we are, I will propose a criterion for assessing public artworks as "acts of citizenship" in democratic cities and discuss three pertinent examples. But the ethnic and cultural diversity of cities, on the one hand, and the intrinsic openness of the meaning of democracy, on the other, suggest that a successful criterion will be paradoxical: it must guide judgment, but, if it is to be true to the city's diversity and the openness of democracy, then it must at the same time always remain a lure to revisions of its own meaning and an interruption of any claim to its final characterization. It must be what contemporary philosophers call an "event." The presentation is also a launch for the speaker's new book, Public Art and the Fragility of Democracy: An Essay in Political Aesthetics (Columbia University Press, 2019), and a celebration of CIQR's 20th anniversary. Bio: Fred Evans is Professor of Philosophy and Coordinator for the Center of Interpretive and Qualitative Research at Duquesne University. He is the author of Public Art and the Fragility of Democracy: An Essay in Political Aesthetics (New York: Columbia University Press, 2019), The Multivoiced Body: Society and Communication in the Age of Diversity (New York: Columbia University Press, 2009; 2011), Psychology and Nihilism: A Genealogical Critique of the Computational Model of Mind (Albany, NY: State University of New York Press, 1993), and co-editor (with Leonard Lawlor) of Chiasms: Merleau-Ponty's Notion of Flesh (Albany, NY: State University of New York Press, 2000). Evans has published numerous articles and book chapters on continental thinkers in relation to issues concerning psychology, politics, and technology. He is currently working on a book tentatively entitled Cosmopolitan Voices: the Political Ethics of Global Togetherness. With special thanks to The Silverman Center of Phenomenology, Campus Barnes and Noble, and Duquesne Office of Marketing and Communication. All interested faculty, staff, students, and other are welcome.